Based in California, Ojai Energetics is an ethics-driven health and wellness lifestyle company that describes itself as “the world leader in developing CBD and CBD delivery methods in the nutritional supplement industry”. They have a so-called Golden Mean Labs, which is tasked with world-class product development. It offers legal, ethical, and innovative products such as CBD Biologix hemp oils. However, what is most special about this company is its promise to make supplements that allow the benefits of CBD to take effect in less than 60 seconds. What makes Ojai Energetics Different? After a brief conversation with the companies manager, we were able to understand why they went with a water soluble solution. When you consider how the body reacts to water soluble content it’s easy to see why they took this route. 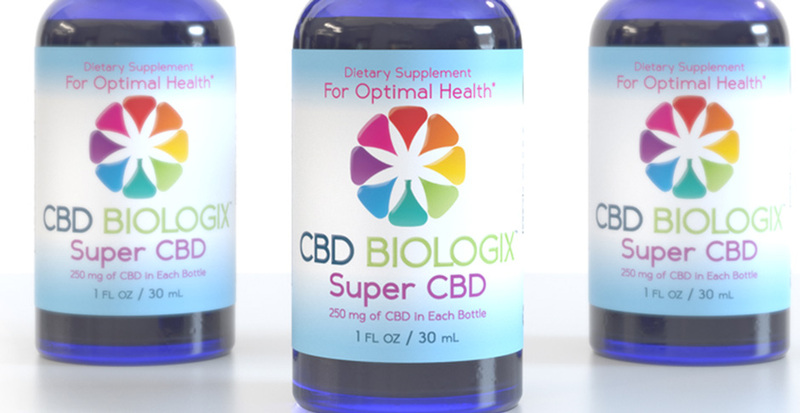 To test the effect, they recommended dropping their CBD Biologix (Super CBD) Tincture into water or any drink and see how it dissolves compared to a non-water soluble CBD tincture. It instantly mixes with the liquid which demonstrates the effectiveness it would have when sublingually taken. Really sets this tincture apart from the other CBD oils we’ve tried. If you are shopping around this is definitely one you should try. We had the chance to sample their flagship product, Super CBD. It tastes like honey and has a smooth texture, without chemical aftertaste. They also recommended to continue dropping until your taste buds detect a bitter flavoring, then observe results and adjust accordingly. Everyone will have a different effect here so it’s important to test with small amounts first to determine the dose that works best for you. Ojai Energetics is best known for its Super CBD. It uses a hydrosome delivery system to absorb CBD in the body. Each 30mL bottle (1 oz.) of Ojai Energetics contains 250mg of CBD. Their online store also features coconut oil, which is CBD infused, and a number of other health products. Super CBD tincture is the main product offered by Ojai Energetics. It is formulated for those people who seeks health benefits from CBD-rich hemp oil for general everyday use. This product won the 2015 Southern California Champion Best CBD Hempcon Cup award. The Super CBD Tincture is priced at $74.95 for a 1 fl. oz /30mL bottle. Each bottle contains 250mg of CBD. Each dose from Super CBD Tincture is equivalent to 2500mg of CBD in regular products. This tincture is water-soluble, which means it passes through the membranes of the mouth and stomach faster than an ordinary CBD oil concentrate. An of approximate 90% of the cannabinoids get destroyed when they pass through the liver if they are not water-soluble. CBD rich hemp and hemp seed oil (CBD typically comes from hemp stalks and stems), moringa (which comes with vitamin A, vitamin C, calcium, and minerals), acerola cherry (a superfood from Brazil filled with vitamin C), organic vegetable glycerin, and pure water are the ingredients for this. Buying a 3-pack of Super CBD Tincture saves you almost 10%. This is priced at $204.60 instead of buying them separately at $224.85. Ojai Energetics is also famous for its coconut CBD oil. Prices ranges from $27.95 to $54.95 for each jar. The coconut oil is infused with CBD oil between 60mg and 150mg for each. Use the coconut oil just like an ordinary coconut oil in cooking by applying it like a topical to your skin. Ojai Energetics Coconut CBD Oil also offers a high dose of fatty acids. It includies omega 3 and omega 6 fatty acids. Ojai Energetics products are classified as hemp. This makes them legal to produce and sell across the United States. Also, THC levels in Ojai Energetics supplements are within federal legal limits for hemp. Other advantages of include the products containing a full spectrum of cannabinoids and terpenes that are essential for CBD’s “entourage effect”. This simply means that they provide maximum health benefits. The company is the first B-corporation in the CBD industry. Ojai Energetics is one of the biggest players in the CBD industry. Super CBD Tincture is not the cheapest CBD supplement on the market. However, it has a higher dose than its competitors. The reason for this is because they use a water-soluble version of CBD. CBD starts being absorbed as soon as it enters the mouth. Not when it passes through your digestive tract. Conventional CBD supplements are not water-soluble, which means that 90% of the active ingredients (the cannabinoids) are cleansed by your liver before they release their active effects into your body.